What is a baby bee to do when he can’t touch or eat pollen in flowers that are yellow or blue? 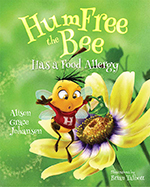 Find out in this tale about HumFree the bee as he learns how to fly safely with a food allergy! HumFree shows us that if he avoids his food allergens and sticks to flowers that are safe, he can have just as much fun with his friends and still fly super fast! HumFree’s story is an empowering tale of awareness and inclusion for children with food allergies so they believe it is possible to do what they love while staying safe. A portion of the book’s proceeds will be dedicated to supporting the food allergy community.